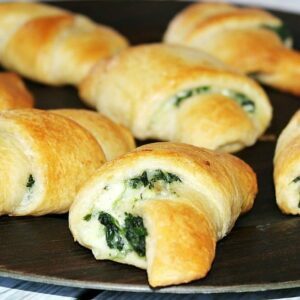 A play on the famous dip, but stuffed into buttery, golden crescent rolls! NOTE- make sure spinach is drained well. Combine all spinach artichoke ingredients into a bowl, using the egg YOLK, set aside the egg white. Mix well. Spread mixture onto the crescent roll triangle. Roll up (like normal) starting at the wide angle to the tip.